CHAMPION New Norfolk footballer Ricky Hanlon has been recognised for his service to Australian Rules Football in the Australia Day honours list today. Hanlon, now living in Queensland, has been awarded the Medal of the Order of Australia. The Tasmanian Football Hall of Fame member started his playing career with New Norfolk in 1979 and was made a life member of the Eagles in 1998. He played a big role in junior development at New Norfolk and also spent time with North Hobart and Scottsdale before pursuing a career in coaching and development in Queensland. In 1990 Hanlon won the William Leitch Medal for the best and fairest player in the Tasmanian Football League. In 1992 he won the NTFL's best and fairest award and in 2000 he was one of several New Norfolk sportsmen and women awarded the Australian Sports Medal. In Queensland he has been the program manager for AFL Cape York, since 2006 and was previously the football development manager for the Cairns region from 1998-2005. 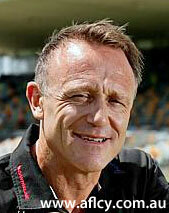 In 2008 he was awarded life membership of the AFL Cairns Juniors.